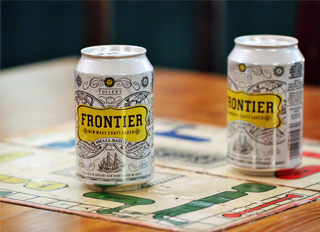 Frontier Lager, Fuller's New Wave Craft Beer, was crowned Champion Keg Lager at this year's International Brewing Awards. Having beaten stiff competition to win the Gold Medal in its category of International Keg Lager 2.9% - 4.7% ABV, Frontier Lager was then crowned Champion Keg Lager at London's Guildhall, where over 400 brewers and cider makers from around the world gathered to see which medalists had been crowned Champions in their category. Frontier's combination of new world hops and old-world brewing techniques - expertly crafted for longer at Fuller's Griffin Brewery - are what gives it its distinctive fruit flavours for which it was crowned Champion. The International Brewing Awards have been held since 1886, and are considered the Oscars of the brewing industry. Over the three-day event in Burton-on-Trent, over 1,100 beers and ciders, split into 44 different categories, were sampled. Blind taste tests were conducted by an expert panel of judges assessing taste, aroma and appearance. Earlier this week, Fuller's were also awarded three prizes at the London Drinker Festival in Camden. HSB won the CAMRA Champion Beer of London in the Strong Bitter category, and London Porter won the Porter Category as well as being named the overall CAMRA Champion Beer of London.